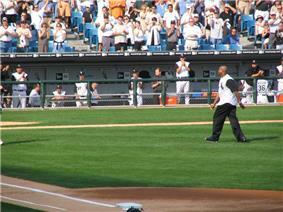 The 2005 World Series, the 101st edition of Major League Baseball's championship series, saw American League champions Chicago White Sox sweep National League champions Houston Astros four games to none in the best-of-seven-games series, winning their third World Series championship and their first in 88 years. Home-field advantage was awarded to Chicago by virtue of the American League's 7–5 victory over the National League in the 2005 Major League Baseball All-Star Game. The Astros were attempting to become the fourth consecutive wild card team to win the Series, following the Anaheim Angels (2002), Florida Marlins (1997 and 2003) and Boston Red Sox (2004). Both teams were attempting to overcome decades of disappointment: the Astros were making their first Series appearance in 44 years of play, while the White Sox had waited exactly twice as long for a title, having last won the Series in 1917, and had not been in the Series since 1959, three years before the Astros' inaugural season. Like the 1982 World Series between the St. Louis Cardinals and the Milwaukee Brewers, the 2005 World Series is one of only two World Series in the modern era (1903–present) with no possibility for a rematch between the two opponents, due to the Astros moving to the American League in 2013. The Chicago White Sox finished the regular season with the best record in the American League at 99–63, the only team to go wire-to-wire in 2005. After starting the season on a tear, the White Sox began to fade in August, when a 15 1⁄2 game lead fell all the way to 1 1⁄2. However, the Sox were able to hold off the Cleveland Indians to win the American League Central Division by six games, sweeping Cleveland in three games on the season's final weekend. In the Division Series, the White Sox swept the defending champion Boston Red Sox. The League Championship Series began with the Los Angeles Angels of Anaheim winning Game 1, but a controversial uncaught third strike in Game 2 helped the Sox start a run and win Games 2–5, all on complete games pitched by starters Mark Buehrle, Jon Garland, Freddy García, and José Contreras, clinching their first American League pennant in 46 years. Manager Ozzie Guillen then led the White Sox to a World Series victory, their first in 88 years. Slugger Frank Thomas was not on the post-season roster due to injury, but the team honored his perennial contributions to the franchise during Game 1 of the Division Series against the Boston Red Sox when he was chosen to throw out the ceremonial first pitch. "What a feeling," Thomas said. "Standing O all around the place. People really cheering me. I had tears in my eyes. To really know the fans cared that much about me – it was a great feeling. One of my proudest moments in the game." The Houston Astros won the Wild Card for the second straight year, once again clinching it on the final day of the season. The Astros embarked on a memorable Division Series rematch against the Atlanta Braves. With the Astros in the lead two games to one, the teams played an eighteen-inning marathon in Game 4, which was the longest (in both time and innings played) postseason game in history. In this game, Roger Clemens made only the second relief appearance of his career, and the first in postseason play. Chris Burke's walk-off home run ended the game in the bottom of the eighteenth. For the second straight year, the Astros played the St. Louis Cardinals in the League Championship Series. Like the White Sox, the Astros dropped Game 1, but were able to regroup and win Games 2–4. With the Astros on the verge of clinching their first ever National League pennant in Game 5, Albert Pujols hit a mammoth three-run home run off Brad Lidge in the top of the ninth inning to take the lead, and subsequently stave off elimination. However, behind NLCS MVP Roy Oswalt, the Astros were able to defeat the Cards 5-1 in Game 6 and earned a trip to the World Series. This was the Astros' first World Series appearance in franchise history. The teams on the field before Game 1. Playing in their first World Series home game since 1959, the White Sox took an early lead with a home run from Jermaine Dye in the first inning. The Sox scored two more in the second when Juan Uribe doubled in A.J. Pierzynski after Carl Everett had already scored on a ground-out earlier in the inning. The Astros responded again in the next inning when Lance Berkman hit a double, driving in Adam Everett and Craig Biggio. In the White Sox half of the fourth, Joe Crede hit what turned out to be the game-winning home run. In the bottom of the eighth, Scott Podsednik hit a triple with Pierzynski on second. Roger Clemens recorded his shortest World Series start, leaving after the second inning with 53 pitches including 35 for strikes, due to a sore hamstring that he had previously injured (and caused him to miss his last regular season start) as the loss went to Wandy Rodríguez. José Contreras pitched seven innings, allowing three runs on six hits for the win. Before exiting, Contreras allowed a leadoff double by Willie Taveras with no outs. Neal Cotts entered the game in the top of the eighth inning. It marked the first time in five games that the White Sox had gone to their bullpen. Cotts pitched 2⁄3 innings before Bobby Jenks was called upon by manager Ozzie Guillén to relieve him. Ozzie signaled for the large pitcher by holding his arms out wide and then up tall. In the post game conference Ozzie joked about the signal by saying he wanted to be clear he was asking for "The Big Boy". Bobby Jenks returned in the ninth to earn the save to give the White Sox a 1–0 lead in the series. On a miserably cold (51 °F (11 °C)) and rainy evening, Mark Buehrle put the Astros on top in the second inning. The White Sox answered in the bottom of the second with two runs off Andy Pettitte. Lance Berkman drove in three runs, two on a go-ahead double in the fifth. In the seventh, Dan Wheeler loaded the bases with a double by Juan Uribe, a walk to Tadahito Iguchi, and plate umpire Jeff Nelson's ruling that Jermaine Dye was hit by a pitched ball. The Astros brought in Chad Qualls, who promptly served up a grand slam to Paul Konerko on his first pitch, the 18th grand slam in the annals of the Fall Classic. In the top of the ninth, Sox closer Bobby Jenks blew the save on a game-tying pinch-hit single by José Vizcaíno. In the bottom of the ninth, Astros closer Brad Lidge gave up a one-out, walk-off home run—the 14th in Series history—to Scott Podsednik, giving Lidge his second loss in as many post-season appearances (his previous appearance was in Game 5 of 2005 National League Championship Series). Podsednik had not hit a single homer in the regular season, but this was his second of the post-season. This was the second time in World Series history where a grand slam and a walk-off home run were hit in the same game. The Oakland A's Jose Canseco (grand slam) and the Los Angeles Dodgers' Kirk Gibson (walk-off) in Game 1 of the 1988 World Series were the first to do it. Never before had a World Series grand slam and a World Series walk-off home run been hit by the same team in the same game. Game 3 was the first World Series game played in the state of Texas. Before the game, it was ruled by Commissioner Bud Selig that the retractable roof would be open at Minute Maid Park, weather permitting. The Astros objected, citing that their record in games with the roof closed was better than with the retractable roof open. Selig's office claimed that the ruling was based on the rules established by Houston and were consistent with how the Astros organization treated the situation all year long, as well as the weather forecasts for that period of time. The game would become the longest World Series game in length of time (5 hours and 41 minutes) and tied for the longest in number of innings (14, tied with Game 2 of the Jason Lane led off the Astros' fourth with a home run to left-center field. It was later shown in replays that the ball should not have been ruled a home run, hitting the left side of the yellow line on the unusual wall in left-center field. The White Sox rallied in the top of the fifth, true to their "Win Or Die Trying" mantra of 2005, starting with a Joe Crede lead-off homer. Uribe, on first after hitting a single, scored on a Tadahito Iguchi base hit with one out, followed by Scott Podsednik coming home on a single by Jermaine Dye. Pierzynski hit a two-out double to Tal's Hill, driving in two runs, scoring Iguchi and Dye giving the White Sox the lead. The Astros rallied in the last of the eighth with two outs when Lane's double scored Ensberg with the tying run after back-to-back walks by Ensberg and Mike Lamb, giving Dustin Hermanson a blown save. Houston tried to rally to win in the ninth, but stranded Chris Burke at third, after he had walked, reached second on an error and stolen third. The Astros tried again in the 10th as well as in the 11th, but failed each time. In the top of the 14th, after the Sox hit into a spectacular double play started by Ensberg, Geoff Blum (a former Astro) homered to right with two outs off Ezequiel Astacio. After two infield singles by Rowand and Crede that went a total of 150 feet according to Tim McCarver, Uribe and Chris Widger walked thanks to Astacio's sudden wildness. The Astros then tried to rally with the tying runs on first and third and two outs after a Uribe error, but Game 2 starter Mark Buehrle earned the save for winning pitcher Dámaso Marte when Everett popped out, bringing the White Sox one game closer to their first championship in 88 years. Buehrle became the first pitcher to start a game in the Series and save the next one since Bob Turley of the Yankees in the 1958 World Series. Many records were set or tied besides time and innings: The teams combined to use 17 pitchers (nine for the White Sox, eight for the Astros), throwing a total of 482 pitches, and walking 21 batters (a dozen by Chicago, nine by Houston); 43 players were used (the White Sox used 22 and the Astros used 21), and 30 men were left on base (15 for each team), all new high-water marks in Fall Classic history. Scott Podsednik set a new all-time record with eight official at-bats in this game. One tied record was total double plays, with six (four by the Astros, two by the White Sox). Things got a little sticky for the Sox in the Astros half of the eighth when reliever Ozzie Guillén brought in Neal Cotts to finish the inning. Cotts induced pinch-hitter José Vizcaíno into a ground out to Uribe. Bobby Jenks, the 24-year-old fireballer, started the ninth inning. He allowed a single to Jason Lane and a sacrifice bunt to Brad Ausmus. Chris Burke came in to pinch-hit; he fouled one off to the left side, but Uribe made an amazing catch in the stands to retire Burke. The game ended when Orlando Palmeiro grounded to Uribe. It was a bang-bang play as Paul Konerko caught the ball from Uribe at 11:01 pm CDT to begin the biggest celebration in Chicago since the sixth NBA championship by the Bulls, co-owned with the White Sox, in 1998. As a result, Jerry Reinsdorf, owner of both teams, had won seven championships overall. The last two Series games technically ended on the same day, Game 3 having concluded after midnight, Houston time. The 1–0 shutout was the first game with a total of one run scored to end a World Series since the 1995 World Series, in which Game 6 was won by the Atlanta Braves over the Cleveland Indians, and the first 1–0 game in any Series game since Game 5 of the 1996 World Series when the New York Yankees shut out the Braves in the last game ever played at Atlanta Fulton County Stadium. This was the second consecutive World Series to be won by a team that has the word "Sox" in its nickname, after the Boston Red Sox won the 2004 World Series against the St. Louis Cardinals. This also happened in 1917 and 1918. Furthermore, it was the second year in a row in which the Series champions broke a long-lived "curse." 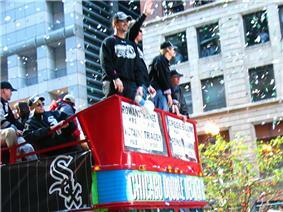 In one of those ways that patterns appear to emerge in sporting events, the White Sox World Series win in 2005, along with the Boston Red Sox win in 2004, symmetrically bookended the two teams' previous World Series winners and the long gaps between, with the Red Sox and White Sox last Series wins having come in 1918 and 1917, respectively. 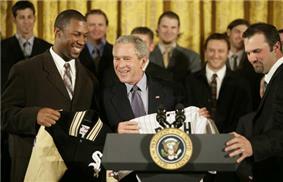 Victorious White Sox players being honored at the George W. Bush. As per their contract, Fox Sports carried the World Series on United States television. Joe Buck provided play-by-play for his eighth World Series while analyst Tim McCarver worked his sixteenth. Joe Morgan provided the play-by-play and analysis. 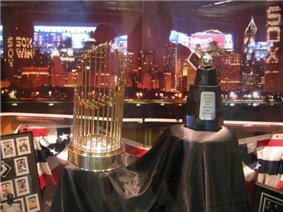 Locally, KTRH-AM and WMVP were the primary carriers for the World Series in the Houston and Chicago markets. For KTRH long time Astros voice Milo Hamilton provided play-by-play while John Rooney called the games for the White Sox. Game 4 was Rooney's last call after seventeen years as the radio voice of the White Sox, as he left to take the same position with the St. Louis Cardinals. The ratings for the 2005 World Series were, at the time, considered weak, but today, given the 2008-2013 ratings, they are considered decent. With an overall average of 11.1, 2005 set a record for the lowest rated World Series of all-time. The prior lowest was 11.9, set by the 2002 World Series between the San Francisco Giants and the Los Angeles Angels (Importantly, this series went 7 games, and the 2005 Series went 4). Following the 2005 World Series, however, the 2006, 2007, 2008, 2010, 2011, 2012, and 2013 World Series produced lower ratings than the 2005 World Series. The record-low 2012 World Series, another 4 game sweep, averaged 7.6 (2.5 points lower than 2005's rating) and 12.7 viewers (4.4 million fewer viewers than 2005). Neither team advanced to the post-season in 2006, but the 2006 World Series again featured teams from the American League Central and National League Central divisions, this time represented by the Detroit Tigers and the St. Louis Cardinals, respectively. The Cardinals won the World Series in five games, in which manager Tony La Russa became the second manager to win the World Series in both American and National leagues, previously managing the Oakland Athletics to the 1989 World Series championship. Both the White Sox and the Astros were in the Wild Card race until the final weeks of the season, with the White Sox finishing with 90 wins, the Astros with 82 wins. The White Sox made their first post-2005 playoff appearance in 2008, while the Astros would not return to the postseason until 2015, their third season as an American League team. 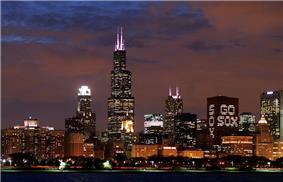 This was the city of Chicago's first professional sports championship since the Chicago Fire won MLS Cup '98. The next major Chicago sports championship came in 2010, when the NHL's Chicago Blackhawks ended a 49-year Stanley Cup title drought. The White Sox crosstown rival Chicago Cubs still have not won a World Series since 1908. ^ "2005 World Series". Baseball-Reference. Retrieved January 6, 2014. ^ "ESPN – Big Hurt is far from forgotten – MLB". Sports.espn.go.com. 2005-10-19. Retrieved 2010-08-29. ^ Singer, Tom (October 27, 2005). "No fear: Uribe goes head over heels". MLB. Retrieved September 30, 2009. ^ "White Sox end 88-year drought, sweep Astros to win World Series". ESPN. 26 October 2005. Retrieved 17 April 2014. ^ "2005 World Series Game 1 – Houston Astros vs. Chicago White Sox". Retrosheet. Retrieved September 13, 2009. ^ "2005 World Series Game 2 – Houston Astros vs. Chicago White Sox". Retrosheet. Retrieved September 13, 2009. ^ "2005 World Series Game 3 – Chicago White Sox vs. Houston Astros". Retrosheet. Retrieved September 13, 2009. ^ "2005 World Series Game 4 – Chicago White Sox vs. Houston Astros". Retrosheet. Retrieved September 13, 2009. History of the World Series - 2005 at The SportingNews. Archived from the original on 2008.